We've launched paperback publishing, expanded distribution to 40,000 online & physical retailers, and released the new Tablo Writer. Today we're delighted to be announcing the biggest product release in Tablo's short history, and one of the most meaningful innovations to come out of self-publishing in the last decade. A lot of hard work has gone into today's announcement, but the message is simple: If you have a story, or even just an idea, with the click of a publish button Tablo can take your books to the world. You can now publish your Tablo books in paperback. 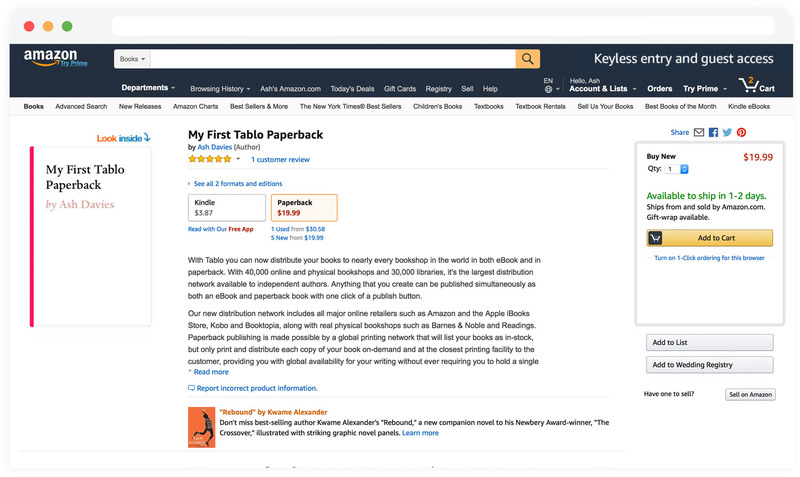 We’ve expanded our distribution network to 40,000 online and physical retailers, including Amazon, making it the largest network available to independent authors. Paperback is powered by a print-on-demand network that lists your book as in-stock with nearly every bookshop in the world but only prints each copy upon purchase, providing global availability without requiring an inventory. 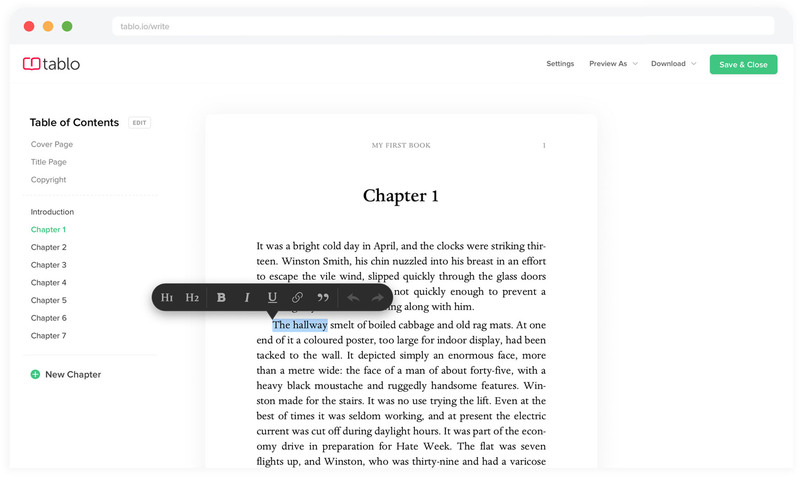 The new Tablo Writer is here, with book templates, and a breakthrough in Word Document conversion that turns your upload into a publish-ready book. We’ve redesigned Author Profiles to act as mini-websites or portfolios for your writing career. All of your books (even the ones you've already created) can now be published in paperback. Even though we're an online publishing platform, we've always preferred the look, the feel, and even the smell of a real paperback. Anything that you've ever written on Tablo, and anything that you upload or write from today, is ready to be printed and published as a paperback book. Tablo now allows you to preview your book in a variety eBook and paperback formats. In the background, Tablo typesets your writing, creates page layouts and generates all of the necessary assets. With the click of a button, our printing network will then turn this into a real book that you can hold. Tablo paperbacks look and feel incredible. They're 8.5" by 5.5" perfect-bound books with warm creme pages and a gorgeous matte cover. Being able to drop in a document or write something on Tablo and hold it in your hands a few days later is an experience that still takes my breath away. You can order your own paperback books in bulk via Tablo's new print-on-demand service, or you can list them with nearly every bookshop in the world with our new distribution network. You can distribute in eBook & paperback to 40,000 online & physical retailers, including Amazon, with one click. With Tablo you can now distribute your books to nearly every bookshop in the world in both eBook and in paperback. With 40,000 bookshops and 30,000 libraries, it's the largest distribution network available to independent authors. Our new distribution network includes all major online retailers such as Amazon, Apple's iBooks Store, Kobo and Booktopia, along with real physical bookshops such as Barnes & Noble and Readings. Paperback publishing is made possible by a global printing network that will list your books as in-stock, but only print and distribute each copy of your book upon purchase and at the closest printing facility to the customer, providing you with global availability for your writing without ever requiring you to hold a single unit of inventory. At bookshops, your paperback book will be listed on the same catalogues that retailers use to order books from mainstream publishers. This means that you, your friends and your readers can walk into your local bookshops and order a copy over the counter. The cashier will say the familiar, "we don't have any here, but it's available, and I can get one in for you." It will be printed and delivered right away. This is the level of distribution usually reserved for mainstream authors. It's available today, from $99/year for eBook distribution, to $299/year for eBook and paperback distribution, and you keep 100% of your sales proceeds after retail margins. 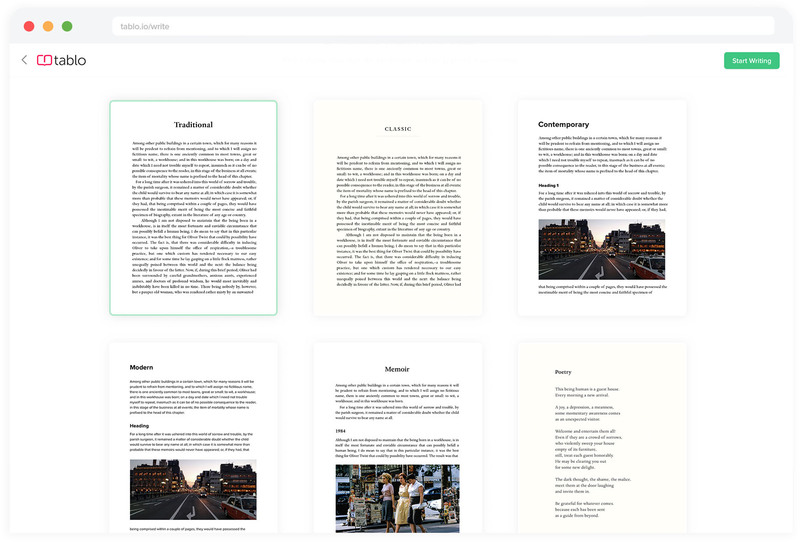 The new Tablo Writer is here, with book templates, and a remarkable new approach to Word Document conversion. We’ve been talking about a new Tablo Writer for a long time. The first line of code for our new platform was written nearly three years ago, but looking at it you’d never know. It’s the simplest book creation product you’ll ever use. You can write or paste something into Tablo from scratch, but the entry point for a lot of authors is to drop in a Word Document. We’ve created a document upload process that lets you drop in nearly any file (even one that's unprepared) and see it transform into a perfectly typeset book with a full Table of Contents. Our breakthrough was inventing a process that reads through your book and learns how you’ve structured your writing. It’s twenty times more accurate than the conversion tools of major publishers, and ten times faster. Anything that you drop into Tablo becomes a real book that can be published in eBook & paperback right away. Tablo also now offers templates for your writing. There are six in total, representing different looks, themes and genres, from traditional novels to family history and poetry. Writing with our new templates is fun, but holding a paperback book in the template you’ve been writing is even cooler. The Tablo Writer is built on our new writing and saving platform. Everything that you write is saved locally to your computer, and backed up to the cloud every few seconds, making it even safer than writing in Word. The new Tablo Writer has been my main writing environment, for emails, communications, presentations (and the occasional story), for months. We can’t wait for you to try it. Your Tablo Profile has been transformed into an author website and portfolio for your writing career. The heart of Tablo is still a writing and reading community where you can share progressively, discover new authors, and connect with opportunities like publisher callouts and writing competitions. 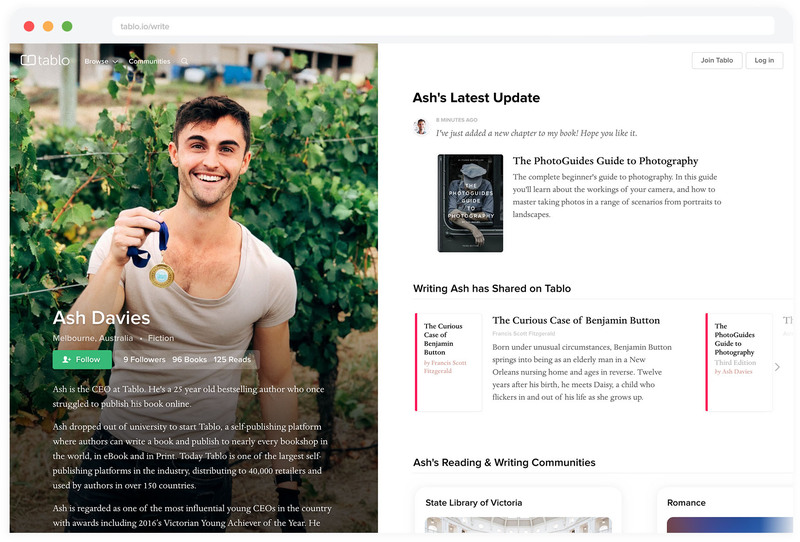 We wanted to make your Tablo Author Profile something that you‘re proud to share publicly — like a website for your writing career — so your Profile has received a major upgrade. On the left of your new Profile you’ll see a featured portrait image and a biography. On the right is a portfolio that displays your latest updates, the books you're writing, and even your favourites on Tablo. 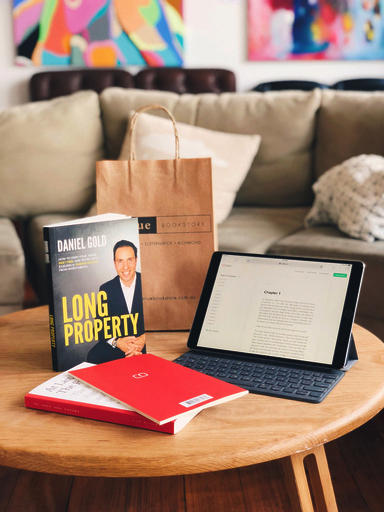 Your Author Profile is a public website that friends and fans can follow to stay in touch with your writing, and it's linked to all of your publishing activity on Tablo. We think the new Author Profiles are going to be a great addition for your marketing. When I started Tablo nearly five years ago, the experience of publishing a book was so difficult that I almost gave up trying. I was so used to the blogging world where you could write something, preview it, click a publish button and see your writing online. 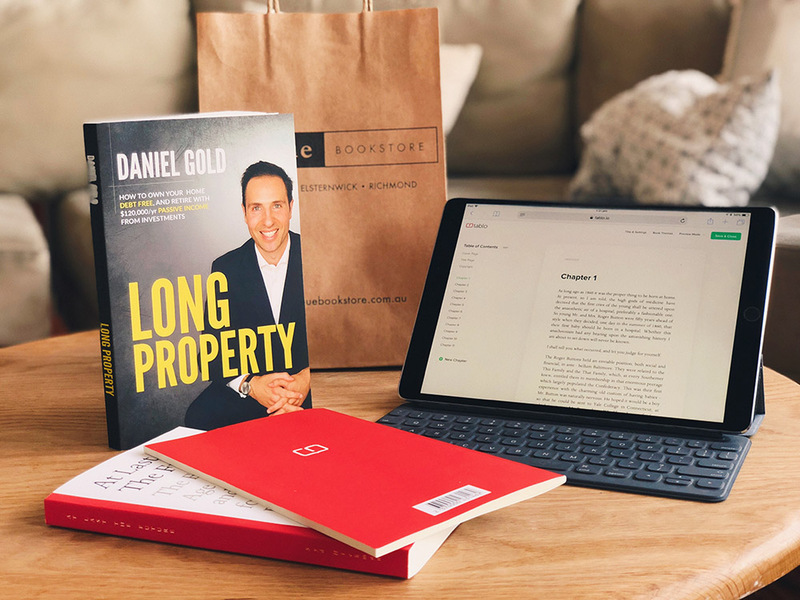 With today’s product launch, Tablo now offers this same experience for your books — you can write something, preview it, click a publish button and see your eBook and paperback book in nearly every bookshop in the world. Thank you to the Tablo team for your incredible work over the years to bring this vision to life, and thank you to all of our authors for your support. We know that it’s people like you who make Tablo such a great place to read, write and publish, and we won’t ever forget that. and encounter the Tablo Team's incredible mind.